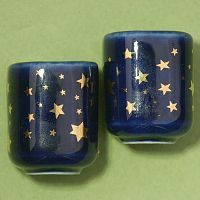 - A set of two gorgeous cobalt blue candle holders, with bright gold stars. These are the ones I reach for, time and time again. I just love that heavenly blue, with the sprinkling of stars. They can be used for any sort of ritual or intention, although they are especially appropriate for any working where you are seeking to tap into universal cosmic forces. They are also great for rituals dealing with wishes and dreams. These cobalt blue porcelain candle holders measure just over 1" tall. 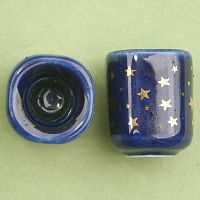 The opening is 1/2" in diameter, just right for our mini candles. 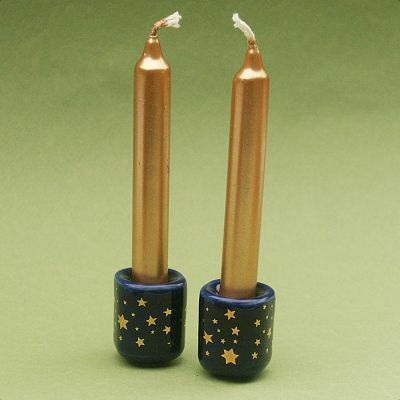 Do you have any other questions about our Pair of Gold Stars Mini Candle Holders? Absolutely beautiful! Just the perfect size for my portable altar. 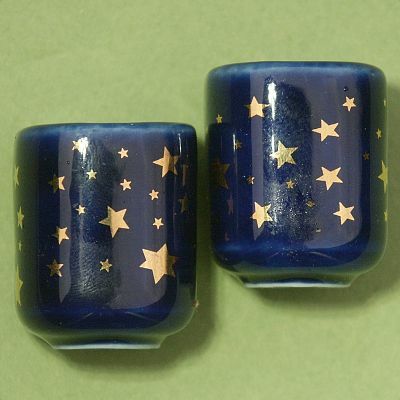 Beautiful little candle holders, fantastic cobalt color. Perfect size for a travel altar/shrine, or for the pagan without much altar space. These are small and dainty and oh-so-charming. The mini taper candles fit perfectly into these.